The Savona Balancing Rock is a huge boulder left over from erosion and delicately balancing on a clay hoodoo. 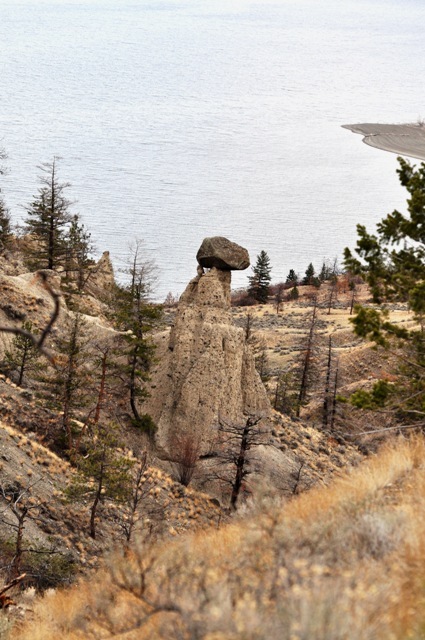 Known by local First Nations' as "Coyote Rock" the landmark, which rests on ranch land, is located on the shores of Kamloops Lake. Legend has it, that the rock came to rest where it is today as the result of a long standing feud between the Okanagan and Secwepemc First Nations people over ownership of the land. It's been said that the Secwepemc and Okanagan First Nations people were involved in a battle for many years. In an effort to end the dispute, a competition was held where the strongest man from each side would try and balance a large rock on top of a standing rock. Try as he might, the Okanagan man could not lift the rock. The Secwepemc man tried and did lift the rock, balancing it on top of the standing rock, and as a result, the Secwepemc won the rights to the land. The Balancing Rock is located just past the lookout where the picture on the back of Canada’s first 100 dollar bill was taken. The lookout is a popular rest stop for tourists offering picnic tables with a breath taking view of Kamloops Lake. Shortly after you pass the lookout you will see a dirt road on your right with a gate. You can park there and walk along the highway back towards the lookout keeping your eye on the valley until you see the Balancing Rock. The rock is located on private land so be sure to get permission if you would like to see the rock close up. For years I have been going to the Balancing Rock and visiting the Wizard during times of trouble. As I enter the magic gates marked by a simple white flag and head down the trail, time stands still. I am suspended in a place where the past, the present and the future all melt into one creating a Vortex. It is here where I am able to rise above the worries and fears of my daily life and enter a state of clarity where I can see things for what they really are. With every step down the trail my body feels lighter and more energized. When I reach the Balancing Rock I stare in awe at its power and beauty. I bow before the Rock as a sign of respect before continuing on to the alter chair. The alter chair is located in the middle of the trail a short distance from the Balancing Rock. It is made up of a few tree roots that cross the trail and provide a bench. I sit down and take a deep breath then turn my head to the right to find him: the Wizard. Covered by a mound of clay he stands frozen in time in front of his alter waiting to grant my next wish. 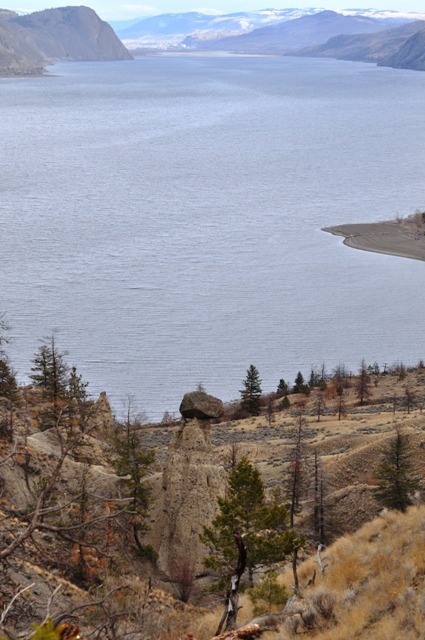 I looked down the valley and noticed a line of Hoodoos that seemed to start near the shore of Kamloops Lake and end just before the Balancing Rock. 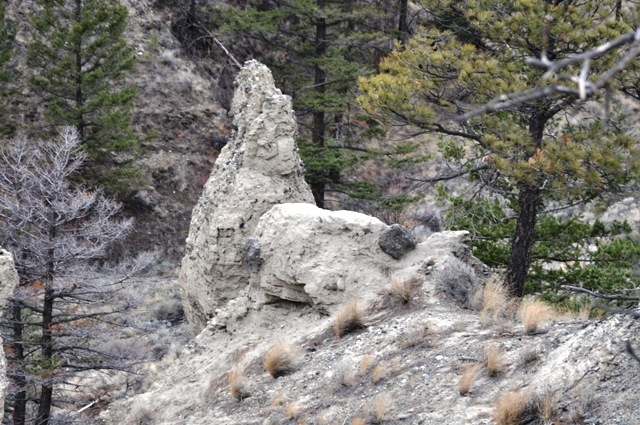 As I looked closer I noticed that each Hoodoo seemed to be more that just a mere tower of windblown clay; each one resembled a person. The Hoodoo at the top seemed to call to me. I stared into the clay mound and I could not believe my eyes; it seemed to materialize into the form of a wizard standing at an altar. Upon the altar was a small rock: a tiny replica of the Balancing Rock. “Who are you and how did you get here?” I asked as I gazed at the wizard. After a long silence, the wizard began to talk to me through the pictures and images that entered my mind. The legend of the Balancing Rock began to reveal itself to me. Over a thousand years ago a tribe of wizards and sorceresses inhabited the valley near the shores of Kamloops Lake. The Valerians as they called themselves were a very peaceful tribe. They lived off the land and what the land could not provide they created themselves through white magic. They fully enjoyed the abundance of the valley and knew nothing else. The leader of the tribe was an old wizard by the name of Valor. His wife Trinity died in childbirth leaving him to raise their beloved daughter Holly-Trinity on his own. Holly was the joy of his life and a friend to all. Her beautiful brown hair glistened in the sun as though made of pure chocolate while her sparkling hazel eyes mesmerized anyone caught in her gaze. Holly-Trinity seemed to epitomize the loving, carefree nature of the Valerians. The Valerians spent their summers canoeing on the lake, fishing and exploring the vast valley they called home. During the winters they would hunt for deer, go ice fishing and spend long nights around the campfire telling stories and conjuring up white magic. They lived in peace and harmony enjoying life’s simple pleasures…but that was about to change. The Montanes were a tribe who lived in the mountains above the Valerians. The two tribes had lived close to each other for generations without ever knowing the other existed. The Montanes had no magical powers; they relied on hard work and ingenuity for survival. They built warm shelters to protect themselves from the cold winters and wooden gazebos to hide from the hot summer sun. They planted vegetables in the spring and went hunting in the winter. For fun they played musical instruments, danced and had huge feasts. They also enjoyed making sculptures, jewelry and pottery. They were a very spiritual tribe who lived a peaceful and happy existence…but all that was about to change. One winter an extreme cold front moved through the mountains making it impossible for the Montanes to hunt for food. The elders made the decision to relocate the tribe to the valley below where it was warmer. The Montanes gathered up their supplies and made the long trek down the mountainside. When they got to the valley they discovered the Balancing Rock. The elders felt this was a sign from the Gods. They believed if they set up camp at its base, the Balancing Rock would protect them. So they did just that. One day when Valor was out hunting with some other tribal wizards when they came across the Montane’s. They could not believe their eyes; another tribe had taken over their sacred Balancing Rock Valor informed his tribe of this discovery and for the first time in the Valerians long history they began to feel fearful. What if this new tribe was hostile? What if they took over the Valerians hunting grounds? What if they continue to migrate towards the lake and take over the Valerian’s camp? What if the abundant valley could not support both tribes? Their fear was not based on any facts or evidence but that did not stop it from growing once the seed was planted. Holly-Trinity was the only one who was not ruled by fear. She assured her people that the valley was abundant and could provide enough for both tribes. She encouraged them to meet with the Montanes and welcome them into the valley. No matter how hard Holly tried to ease their fears the Valerians refused to see the truth and soon their fears turned into hate. Days were spent discussing how evil the Montanes were and how these war-mongering people planned to harm them. The stories and rumors grew bigger and bigger taking on a life of their own. Valor knew he had to do something to protect his people from the Montanes…but what? At sunrise he went to the Balancing Rock to ask for guidance. He stood at the foot of the magnificent rock with his arms wide open until the answer to his problem hit him like a bolt of lightning. He knew what he had to do. He hurried back to the Valerian’s camp to set his evil plan in motion. As the sun began to set the entire Valerian tribe scurried about preparing for the execution of Valor’s plan. Each member dressed up in the tribes’ traditional hooded robes. Valor put on his wizards hat and carried the tribe’s ceremonial wand. Once the full moon had risen over the mountainside lighting up the valley below Valor gave the signal. With Valor in the lead the entire tribe began to ascend the hillside towards the Balancing Rock…all except Holly-Trinity that is. Unable to stop the Valerians from their course of destruction she did the only thing she could do. She slipped away from the camp undetected and made her way to the Montane’s camp. The Montanes were all sleeping soundly in their makeshift shelters oblivious to their impending doom. Holly could not bear to see harm come to these peaceful, unsuspecting people. She boiled some sagebrush leaves and cactus in a small cauldron over an open fire then allowed the concoction to energize in the moonlight while she recited this spell. Holly-Trinity could see her people advancing up the hill and knew she had to act quickly. She placed three drops of the concoction on the forehead, throat and chest of each Montane creating a blanket of protection over them as they slept. Then she climbed up the hill and hid in the branches of a lone pine tree helplessly watching the events of the evening unfold. Once Valor reached the sacred site, his tribe came to a grinding halt and waited for their next command. Valor constructed an altar and on it he placed a small rock that resembled the Balancing Rock. Then he waited in silence. The moon made its way across the sky before it finally reached a point just above the Balancing Rock. At that very moment a moonbeam darted from the sky connecting the Rock to its smaller counterpart on the wizard’s altar. The wizard raised both arms into the sky then led his people in the following chant. Valor placed the tribe’s ceremonial wand on the rock on the altar. Then he commanded the Balancing Rock to fall from the sky and crush the Montanes. What happened next was the greatest tragedy ever bestowed on the people of the valley. The ensuing legend would serve as a warning for generations to come. While Holly watched in horror from the safety of the pine tree, the Balancing Rock lowered back onto its pedestal. Then like an avalanche the earth fell from the sky and covered every Valerian in a thick coat of clay and mud. In a flash the Valerians were transformed into Hoodoos. From far away they looked like large mounds of clay corroded by the wind but up close one could see the expression of terror on the face of each Valerian now caged indefinitely in a clay prison. The first law of the Hoodoo states“Those who do harm onto others…do harm onto themselves”. This simple law binds everyone on Earth. By trying to harm the Montanes the Valerians sealed their own fate. The Montanes slept peacefully through the night and had no idea about the Valerians plot to destroy them. 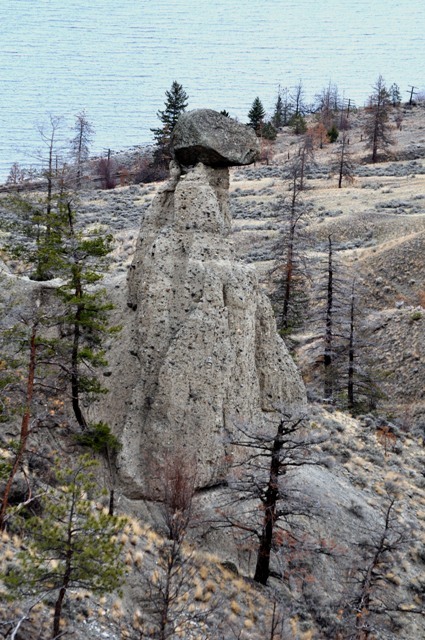 They awoke the next morning to see a line of Hoodoos leading down to the lake. Feeling this was another sign from the Gods they followed the trail of Hoodoos down to the abandoned Valerian camp. This camp was way better than their makeshift camp by the Balancing Rock so they relocated. They lived in the Valerian camp until the ice on the lake melted then they used the Valerian’s canoes to explore the waterways in search of a permanent home. That spring they discovered an incredibly beautiful paradise only a day’s paddle East of the camp. A huge valley was nestled in the vast mountains at the meeting of two great rivers. There were forests full of trees for making huts, plenty of wildlife for hunting, and mild temperatures …never too hot and never too cold. The Montanes had found their new home. They named it Kamloops, which in their language meant “the meeting of the rivers”. Holly-Trinity was the only Valerian to survive that fateful night. She almost drowned in a pool of her own tears so distraught was she over the loss of her beloved tribe. They were such a peaceful and loving people whose fears led them to an unthinkable doom. The story ended there. The images of Valor and the Valerians that came alive in my mind vanished into thin air back into the Hoodoos from which they came. But where the story ends legend begins. When I was a small child I often heard people refer to an angel called Holly-Trinity. If someone had a wish they wanted to come true people would often tell them to pray to Holly and she would bring them to the wizard. According to the legend Holly died a few years later of a brokenheart. She missed her friends and family and prayed to reunite with them in the afterworld. She knew the only way for this happen was by the second Law of Hoodoo, which states, “Those who do good onto others…do good onto themselves”. Every time the ghost of Holly-Trinity leads someone of pure heart to the alter chair and has them place their wish on the wizard’s alter, Valor and the Valerians use their magical powers to grant the wish. Every time a wish is granted a strong gust of wind blows through the valley and removes a layer of clay from the Hoodoos bringing the Valerians closer to freedom. One day the Hoodoos will be gone and the Valerians will take their place in the afterlife to reunite with Holly-Trinity. 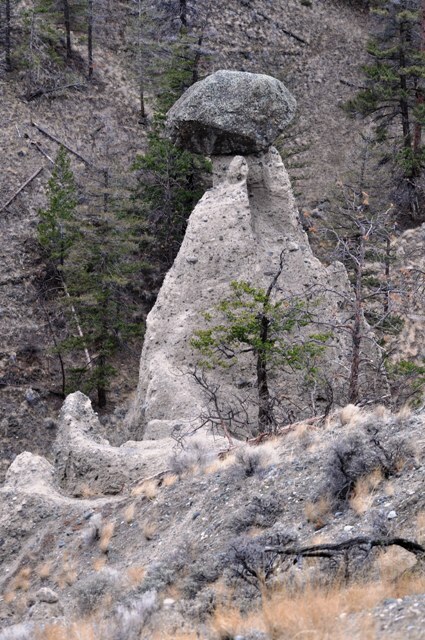 One of the Hoodoos looks like a Wizard in front of an altar.